I’m back for Day 2 (or Day 4 for everyone else who started on time!) of the 31 Day Blog Challenge. Today I wanted to share a simple way to practice free motion quilting (fmq). I really enjoy making bags! What quilter doesn’t need 273 bags to carry fabric, notions and other supplies to and from the quilt store, retreats and so on?! Bag patterns certainly range from simple to complex, but one commonality is that they are smaller (at least usually!) than a quilt top. Having a smaller project can make taking a spin at fmq - or even walking foot quilting- feel less daunting. I tend to think that a quilt is much more precious to me overall than a bag. 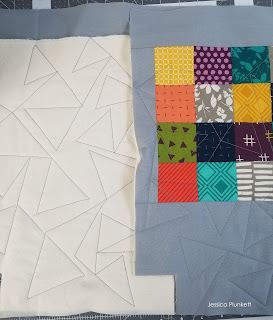 This feeling makes me nervous to try out fmq – I do not want to screw up all the hard work I did making the quilt top. But with a bag top, if something doesn’t quite go right, I’m okay with either the imperfection or even starting over if needed. This is why I like to practice my fmq skills with bags. Typically, I will use batting and muslin to make my quilt sandwich with the exterior of the bag. The muslin is thinner than a regular quilt back, so it’s important to keep this difference in mind. I will pin (or spray-baste which is a technique still new to me) simply to practice this as well. Then, I have fun! I decide what type of quilting I want to do. Now, I also practice straight line quilting or quilting with my integrated walking foot. That is what I did with the bag image on this post. My goal was to make organic triangle shapes. I started in a straight line, stopping to pivot where needed and continuing on in a straight line again. I love the result and feel more confident with each bit of practice I get! How do you practice your fmq or straight line quilting skills?